Something different, as far as production, but Devlin manages to maintain his own style that fans will be pleased to hear, complete with complicated lyricism, Devlin shines on this polished underground-sounding crossover effort, I think it allows new fans to not judge his content on the intensity of the beat, therefore he will no doubt have all the attention on his lyrics, which will no doubt gain him more fans, an overall good song, no doubt, easing himself onto a higher platform as a more inspirational emcee, one the UK should definitely be proud of. The video is good, it has an epic feel to it and introduces Devlin nicely, featuring cameos from Ghetto and Griminal, this video can do the Dagenham soldier no harm as he rises to further prominence. While 2009 saw some positivity with many urban artists breaking through into the charts, it also saw the negative with many artists being blackballed, Giggs prevailed and recently signed a contract with XL recordings, so there is hope and nobody deserves some mainstream recognition than of the elite emcees in the Grime scene..Ghetts. As a fan of Ghetts, you beleive in his talent and you cannot help but to expect nothing but the best, so at first instance this track deceives those expectations, however this strangely allows you to focus more on Ghetts and his flow really provides the track with much needed depth, Ghetts reaches out to up and coming emcee Maxsta (also from East London) as well as long time collaborator and friend Dolla, both features deliver, Maxsta (who is one of the artists I tipped last year after hearing one of his sets) has progressed well since, now working with some of the best in the scene, this track is an obvious example of his development thus far, with Dolla stepping up to lay down his opinions to those who feel he has fallen off. The video is a light hearted portrayal of the artists within a dark themed set, featuring a host of cameos including appearances from Mz Bratt, Devlin and Griminal, the video is directed by Digital Dan, who uses his abilities to capture the right vibe and offer the track a matching visual. Skadoosh is taken from the forthcoming mixtape ‘Calm Before The Storm’, which will then set you up for the new album, ‘Rebel With A Cause’, so look out for more from Ghetts (aka Ghetto) as he looks set to start the year off his way. 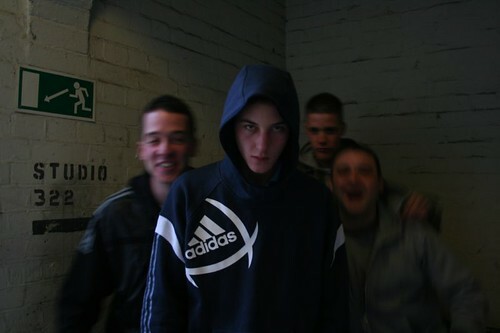 This image shows how far the scene has come..
Devlin has been a prominent fixture in the ever rising Grime scene, considered as Ghetts’ protege, Devlin is one of the founding members of the highly respected and even feared collective, ‘The Movement’ along with Wretch 32, Mercston, Ghetts and Scorcher. Numerous mixtapes, verses, freestyles and features kept his name within talk of the future of the scene, for a while though as artists began to establish themselves further, we did not hear much from Devlin. Devlin returns with an anthem for the city, a feel good song that feels as real as it sounds, lyrically honest, Devlin manages to capture the atmosphere well, it reminds me of The Streets – Blinded By The Lights, only in the sense that it’s a night out track but slow in tempo, it tells a story, almost as if your with Devlin on a night out in London City. The video compliments the song well, directed by Digital Dan, one of the hardest working directors in the scene, putting Devlin into the spotlight, capturing him well with landscapes of London, to be honest, like the London Eye and Big Ben we should be proud of Devlin and the quality he possesses as an artist. Cameos from Ghetts, Griminal & Lil’ Nasty add a certain level of excitement, Ghetts has taken both Devlin and Griminal under his wing as he helps to establish the two undoubtly talents, it adds to the song and videos feel good vibe. London City, is a great track as Devlin makes a return to the scene, to claim his spot as one of the best the UK has to offer.